You may have heard me mention, several dozen times, that I don't like winter. Technically spring will arrive at the end of this month but you'd have trouble believing that lately. Oh, I know, March comes in like a lion and goes out like a lamb. But we're still very much in lion mode around here. We had snow, then torrential rain, then more snow than more rain. Sigh... This past weekend we got a tiny little taste of what's to come. Not that it was warm but at least we could walk from here to there without risking frostbite. Brian and I met a dear friend for brunch on Sunday, then stopped at a bakery for a loaf of fresh bread and wandered a bit in Sur La Table. He checked out the gadgets, I lusted over a display of the new Le Creuset color (soleil) before we strolled home. But it was still chilly enough that the mile or so walk made me long for my bed and a hot bowl of soup. And since we had that loaf of fresh bread, I put on a pot of broccoli and cheddar soup to go with it. We'd had a late brunch so the hearty soup and bread made for a perfect light dinner. A warm comforter and some Sunday night television made for a good end to the weekend. Enjoy! Add the butter, onion and garlic to a Dutch oven or other large stock pot and cook on medium low heat for approximately 15 minutes or until the onions are translucent but not browned. Whisk in the flour and slowly whisk in the chicken stock. Add the broccoli, bring to a boil, cover and cook for approximately 25 minutes or until the broccoli is tender. Working in batches, add the soup to a blender or food processor and puree. Be careful not to overfill or the hot liquid will leak out of the blender. You can puree all the soup or leave it as chunky as you like. This can also be done right in the pot with an immersion (stick) blender. Place the soup back in the stock pot and turn the heat to medium. Add the milk and cheese and season with salt and pepper. Serve hot and garnish with additional cheese, if desired. Makes approximately 8 servings. Our weather has been the same. I was excited to see grass (well, mud) in our yard, only to have it vanish under new snow yesterday. Spring can not come fast enough! Your soup looks and sounds perfect, also, love the bowl..so pretty. Anita, that's a perfect soup for this weather! This looks so good! I just love a comforting cream soup! I live in Seattle, so I can totally relate to the torrential rain. Not fun for sure, but this broccoli soup would make it a bit more tolerable. It looks delicious, and I low calorie too. Yeah, they are saying more snow and rain tomorrow in Chicago. Looks like it will be soup for me until this so called lamb shows up. Mmm your soup sounds lovely, I love cheese in soup! 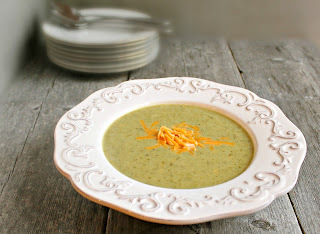 I love broccoli cheese soup, so comforting! I am over winter. It has been a hard adjustment moving from Austin back to Colorado! Soups have been my savior though, and this one looks particularly delicious. Thank you for sharing it with us! I feel guilty telling you this but we've had weather in the 70's this week in Northern CA. I love all the seasons but then again, we live in Northern CA so it is pretty mild all year round. I LOVE this soup! So comforting and perfect any time! I absolutely LOVE winter! However, when its dreary, grey, bitterly cold and all the snow is gone...I'm totally done. We had a nice little snow storm in PA yesterday so my tolerance has been restored! But I too will be making soup to keep me warm. I love Broccoli and Cheese soup! Thanks Anita for sharing at Foodie Friends Friday!